This paper reports the responses of 235 tertiary commerce students to a questionnaire in relation to their learning and assessment experiences. Significant correlations between measures were used to identify underlying constructs within the overall set of variable measures. Logistic regression incorporating the factors was then used to further distinguish differences between students on the basis of their ethnicity, gender and age. These three demographic characteristics highlighted statistically significant differences across values and beliefs held by the student sample. The empirical findings are particularly relevant for those involved in higher education given the diverse and changing nature of the sector, particularly with the changing demographics of ethnicity, gender and age as well as international barriers in tertiary education opportunities. Recently, higher education has moved from being a key element in a country’s development and growth, to being a revenue generating business for many (Clark, 1998; Marginson & Considine, 2000): New Zealand (NZ) is no exception to this generalisation. Managing these issues requires attention to the increasing diversity of the student population. The increase in international female and older students in NZ higher education are a significant factor in the changes in NZ higher education (Altbach, 2004; Marginson, 2000). In 2005, 504 000 students were enrolled in formal study programmes provided by NZ higher education providers (a 3.6% increase from the previous year). Forty-seven thousand of those were international students (Wensvoort, 2006) who require careful consideration and management such as special pastoral care. The focus of this study is to examine key educational cultural factors, particularly concerning students’ beliefs and values about learning and assessment. The main objective of the study is to gain an improved understanding of deterministic and influential factors in the students’ learning experience so that those involved in higher education will be better able to provide an educational experience closer to the ideal. A total of 235 commerce students (aged between 17 & 47 years) at two higher educational institutions (HEIs) in Canterbury, New Zealand: Lincoln University (LU) and Christchurch Polytechnic Institute of Technology (CPIT) completed the questionnaire (61% were female and 39% were male), 60% were European/Pakeha and 40% were Asian, predominantly Chinese. Changing demography is one of the key reasons for the recent changes in higher education (Brown, 2002; Kristensen, 2001). There is a significant gap in the literature concerning the purpose of HEIs. We know that the two primary objectives have always been to research and to educate: HEIs are in the knowledge business and are involved in knowledge creation as well as knowledge dissemination (Rowley, 2000; Singleton-Jackson & Newsom, 2006). There are contrasting views however, concerning the primary function of HEIs (Jeffrey & Manganiello, 1998). Whilst some believe it to be the creation of new knowledge, others consider it to be the dissemination of existing knowledge and there are those who believe it to be a combination of both. Surrounding the purpose of these institutions, management of their functions has moved from a state-funded process to a competitive business model (Smith & Webster, 1998). In New Zealand, post 1984, changes have occurred in the funding and structure of HEIs (Marginson & Considine, 2000). They have moved from completely state funded, centrally organised organisations, to institutions that are effectively separate business units operating in a highly competitive environment (Peters, 1997). Government has, over time, altered its level of funding and HEIs have had to generate their own revenues and implement management structures consistent with a business model (Johnson & Rush, 1995). From this, a number of strategies for increasing revenue have developed, such as the introduction of students paying fees based on a cost of delivery approach (Lauer, 2002), something previously not practised. Other activities have been as diverse as distance education programmes, professional development, and non-matriculant entry, to major international recruiting initiatives. There are two main schools of thought when considering how HEIs should be managed: the first is that HEIs should be managed like a business (Johnson & Rush, 1995). In contrast, the second perspective is that HEIs are representative of the community and it is those within that community who decide what and how HEIs do what they do (Gervedink & Collis, 2005). 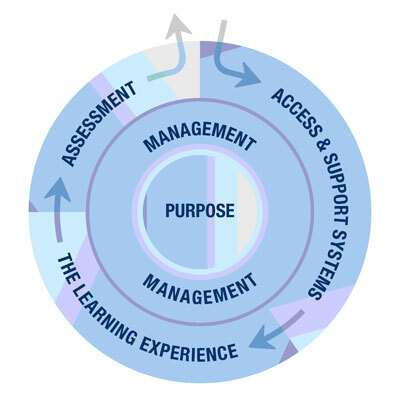 The purpose of this model is to demonstrate the relationship between the institution, the educational process and the individual. The model has been developed from existing literature, and whilst acting as a foundation for this study, it is not an objective of the current research to either formulate these theoretical links, or empirically test their relationships. Whilst always aiming to improve the educational process, education has been evolving to a point where it is not only multi-faceted, but also where individual educational components are highly integrative in nature. Figure 1 below, shows the five dimensions within the model. Higher education is undergoing many changes as it moves from an historical elitist model to a more democratic education for the masses (Faris, 1998, 1999; Smith & Webster, 1998; Starr, 1999). This growth of tertiary enrolments has been accompanied by improvements in the access to a range of historically disadvantaged groups in post-compulsory education and training (Wensvoort, 2006). Of key importance to this investigation is that this new direction in higher education has led to a greater level of access for many who, in the past, have not had such an opportunity (Peters, 1997). Previously, access to HEIs by individuals from low socio-economic backgrounds has been extremely low (Young, 2004). Other important factors contributing to the increase in student access to HEIs include the increased freedom within communist countries and the rise in living standards in less developed nations; all leading to an increase in international students. This increase has created a need to meet the diverse requirements of these students ranging from differences in learning styles and assessment at an undergraduate level, to preparation for postgraduate study and employment. Whilst HEIs state that they are committed to actively encouraging minority and women students, many do so without really considering their existing culture (Brown, 2002). To accommodate educational diversity in the broadest possible context, for example, ethnicity, gender and age, educational culture needs to be examined. Encouraging cultural diversity and greater inclusiveness is aimed at enhancing the learning environment for the entire university community (Brown, 2002; Smith & Webster, 1998; Thomas, 2003); hence management of the student learning experience becomes critical. Traditionally, formal education was a process whereby the older generation passed down what they considered to be valuable information to the younger generation (Jarvis, 2001). However, with a changing environment, it is recognised that new types of learning are appearing to facilitate the integration of learning styles (Oblinger & Hawkins, 2005). It was Bloom (1956) who initially stated that the key to successful learning lay within the motivation of the student, teacher support and feedback. He believed the importance needed to be placed on the individual learning process. To some extent Rogers (1969) supports Bloom when he says that the responsibility lies with the student and that teachers are predominantly facilitators. Whilst the primary responsibility must belong to the student, it is critical that the teacher be aware of the differences across ethnicity, gender and age. Sittenfield (2002) affirms that students who accept responsibility for their own learning are more likely to absorb information in a lasting, comprehensive way. Macknight (2000) recognised that students need to develop and apply critical thinking skills to enable them to better deal with the complex problems they will face in the future in order to compete and survive. For example, ambiguous situations are a fact of life and how a student deals with, or reacts to ambiguity, may have a profound effect on their educational experience (Owen & Sweeney, 2002). This is a significant issue, given the increasing culturally diverse composition of the student population. When considering learning one needs to understand the ways in which an individual learns (Robotham, 1999). Quite probably one’s understanding of the learning experience is partly, at least, culturally determined (Trompenaars, 1993). Differences in cultural backgrounds may also lead to differences in expectations. Therefore, the provision of an appropriate learning experience includes understanding how people learn, the importance of the learning environment, and pedagogic methods and approaches suitable to the particular situation (Spencer & Jordan, 2001). Culture plays an important role in cognitive development (how one acquires knowledge) of learners through communication and social interaction. For example, Chinese students are very much educated by rote learning (Martinsons, Martinsons, & Aelita, 1996). Consequently, this will affect the learning process of the Chinese individual. Learning outcomes need to determine the nature of the learning experience (Spencer & Jordan, 2001), and whilst it is recognised that there is no one best approach to the development of knowledge, traditional models of education still predominate. Because student populations within HEIs are more culturally diverse than ever before, there is a need to revise these pedagogical traditions (Marginson, 2000). As the learning environment becomes more flexible, pedagogies need to become more pluralistic (McLoughlin, 2001) (in this context, pluralism means the deliberate introduction of multiple perspectives where there are many alternatives, as opposed to one correct solution). Again, this has implications for the learning experience amongst different ethnicities, genders and age groups. Increasingly, more individuals take advantage of the opportunity to gain qualifications and expertise at HEIs in countries other than their own (Myburgh, Niehaus, & Poggenpoel, 2002). Consequently, teaching staff need to learn to cope with, and address the differences in learning styles and expectations. It is important to create common standards of learning and whilst this may seem the opposite to diversity, it is in fact central to it, for it establishes a core set of skills and learning that is vital to a diverse community (one that varies across ethnicity, gender and age). It also affirms an equality of access to a more general and less parochial intellectual culture (Brown, 2002). It is often assumed that course content, assessment and learning experiences have the same relevance and meaning to diverse audiences (McLoughlin, 2001). However, research on students’ expectations of higher education suggests that they are dependent on a number of factors that include ethnicity, gender and age (Sander, Stevenson, King, & Coates, 2000). It is impossible to overstate the importance of assessment in the educational process. It is one of the most important influences on learning; not only what is learnt but also how it is learnt (Spencer & Jordan, 2001). The idea of quality assessment is not new (Partington & Brown, 1997). Robson (2005) explains that measurement is a way of assessing a situation. It has been noted that measurement systems can have a critical impact in either encouraging or discouraging a culture of high performance. More specifically, Stapleton (2001) defines assessment as a systematic procedure for measuring a sample of learners’ thinking or behaviour to make a judgement about them. It serves many functions ranging from measuring academic achievement to predicting future performance, but ultimately the purpose is to assure that outcomes have been achieved. Spencer & Jordan (2001) affirm that an assessment procedure can be either formative or summative. Formative assessment is intended to provide the student with feedback on progress to help identify strengths and weaknesses, and is usually an informal and ongoing process. On the other hand, summative assessment is formal and usually occurs at the end of a prescribed period of instruction, for example a test. Students need to demonstrate their knowledge and skills, and feedback is given as part of a summative process which may also be informative. With the perception by some that students are customers, who are increasingly aware of their rights, including the formal and informal feedback processes, Sander, Stevenson, King, & Coates (2000) advise that it would be wise to acknowledge and adhere to formative and summative assessment procedures. If HEIs manage their changing multi-cultural student population, attention must be given to the use of methods of instruction and assessment that are more inclusive (Prime, 2001). Further, McLoughlin (2001) adds that new learning and assessment designs are required. This involves a re-evaluation of teaching and assessment approaches to ensure that diversity is acknowledged and that cultural issues become part of the instructional design process. For example, Tippeconnic & Faircloth (2002) demonstrate the need for culturally and linguistically appropriate assessments. Student and lecturer values may play a significant role in influencing approaches towards assessment (Greenbank, 2003). According to Sugar & Bonk (1998) students who learn in an environment where diverse perspectives are encouraged often become better critical thinkers, better communicators, better problem-solvers and better team players. Critical thinking is a common objective of various disciplines and a goal that most faculties aspire to (MacKnight, 2000). However, there are those who claim that certain groups of learners, specifically Asians, are deficient in critical thinking abilities because they have been raised under social practices where group harmony and conformity are stressed (Stapleton, 2001). James (2003) suggests that HEIs would benefit from a more sophisticated strategy for helping shape effective teaching and learning processes. Whilst standardisation of assessment is sometimes effective for assessing student achievement, tailoring to specific course requirement programs is also necessary (Black & Duhon, 2003). There is no one right assessment instrument for measuring, and the challenge is to match the usefulness and relatedness of an assessment instrument to several factors (Spencer & Jordan, 2001). Evaluation of learning is a complex process that takes place within many different contexts and is conducted by individuals with widely varying values and philosophies (Cranton, 2006). Diversity is intended to raise standards by subjecting everyone’s provincialism to assessment from multiple perspectives. Prime (2001) proposes that when a single method of assessment is almost exclusively used to measure learning, then only those for whom there is a good fit will be successful. Internationalisation is a challenge to quality assurance (Sursock, 2002) and implementing a meaningful assessment program is required (Taylor, 2002). James (2003) expresses concern regarding current practices in student assessment and academic standards. Assessment is most effective when it reflects an understanding of learning as multidimensional and integrated, and is revealed in performance over time (Dewey, 1972). Learning is a complex process that entails not only what students know, but what they can do with what they know; it involves not only knowledge and abilities but values, attitudes and habits of mind that affect both academic success as well as performance beyond the classroom. Ideally, assessment will reflect these understandings by employing a diverse range of methods, including those that call for actual performance, using them over time so as to reveal change, growth and increasing degrees of integration. Such an approach aims for a more complete and accurate picture of learning, and therefore firmer bases for improving students’ educational experience (Bloom, 1956). There can be no greater determinant of a student’s perception of his/her own ability to succeed than the feedback which assessment provides (Prime, 2001). Figure 1 discussed above consists of five educational cultural components; however this research is concerned only with the elements of learning and assessment. Evidence of differences in learning and assessment, across ethnicity, gender and age, provides an ideal foundation for HEI management to develop strategies for positioning their institutions in an increasingly competitive market. However, having a clearer understanding of the subtleties of these differences is the key to improving academic programmes, in a manner that supports the diversity of the student population. Tertiary commerce students provide ideal subjects for assessing demographic differences in learning and assessment, due to the nature of commerce subjects undertaken. Commerce courses differ in terms of interpretative, technical and quantitative content, thereby offering sufficient variation on which to assess student differences. The research approach, a questionnaire survey, was considered the most effective method for collecting the data, given the nature of the information to be collected and the time constraints within which the information was to be collected. It was conducted with the intention of exploring the beliefs and values of higher education (commerce) students regarding learning and assessment. The respondents were selected using a systematic sampling approach, choosing individuals from the population on the basis of availability during lecture times. All respondents were studying towards a business undergraduate degree at LU or CPIT. A total of 235 questionnaires were completed by second year undergraduate commerce students at LU, and CPIT, during the latter half of 2004. The student sample was selected on an availability basis. A pilot test was conducted to detect weaknesses in the initial questionnaire instrument. This was done by way of focus group. The focus group consisted of Senior Lecturers and undergraduate business students, male and female, native English-speakers and non native English speakers. The group members were diverse in experience and cultural backgrounds and were professionally or personally familiar with educational culture within HEIs. This pre-testing was helpful in refining the instrument eliminating possible errors resulting in improvements in the quality of data obtained. Several modifications were made prior to the final distribution of the questionnaires. The research strategy used was a cross-sectional survey. The survey was administered to students during scheduled classes after consent to participate had been obtained via a letter of permission. When asked to respond to the survey students were selected on an availability basis. At LU, 2004 recorded the highest number of Equivalent Full-Time Students (EFTS); of those 1871 were international students and 1778 domestic students (Lincoln University, 2006). The high proportion of international students studying at Lincoln University made it an ideal environment from which to draw ethnically comparable data. The increasing number of international student enrolments with their differences in learning orientations increases the need to become fully conversant with issues related to cross cultural approaches to learning (Rambruth, 2000). The scale measured agreement with generated statements from 6, strongly agree, to 1, strongly disagree. Respondents also had a zero option of stating they had no opinion for questions which they considered irrelevant. Whilst a Likert scale is typically a five-point scale with a neutral position, it was decided to use an even scale to force a response in order to ensure discrimination between respondents. This was considered necessary in order to differentiate between attitudes on the basis of characteristics such as ethnicity. A pilot test was conducted to detect weaknesses in the initial questionnaire instrument. This was done using a focus group. Several modifications were made prior to the final distribution of the questionnaires. The data were analysed using SPSS. The data was edited and tabulated using marginal frequency analysis on each individual variable. The results from the bivariate analysis highlighted significant similarity in patterns amongst different attitudinal variables, when they were cross-tabulated with ethnicity and gender (see Table 2). The Chi Square test was used to test for independence in these various bi-variate relationships. The research then used factor analysis to identify attitudinal factors affecting commerce students’ learning and assessment experiences. The factor analysis uses both oblique and orthogonal factor rotations. The correlation matrix for the 27 attitudinal variables is statistically significant (The level of statistical significance = 90% or higher) between 168 paired variable combinations. This supported the decision to undertake factor analysis. The component analysis revealed 9 factors generated from the 27 original variables which accounted for 59.1% of the variance in the 27 variable data set. Both orthogonal and oblique rotations were used, and, in both instances revealed an identical 9 factor solution. Whilst the factor loadings were almost identical between the two rotated solutions, the oblique rotation gave factor loadings above 0.5 on 26 of the 27 variables, whereas the orthogonal rotation only loaded above 0.5 on 23 variables. The oblique rotation revealed inter-factor correlations of 0.38, 0.37, and 0.22 between three sets of factors, with the remaining 33 inter factor relationships being less than 0.22. Although the correlation between obliquely rotated factors was low, an initial regression analysis was undertaken using both rotated solutions. Each of the factor solutions was regressed against ethnicity and gender using logistic regression, and against age using multiple regression, as explained earlier. Multi-collinearity in the regression solution for the oblique rotation was tested for and found to be insignificant, and therefore it was decided to use the oblique solution in further analysis due to its improved explanatory power. The final factor solution is given in Table 1. Factor One (F1): Heterogeneity in living, thinking and learning. Following this, regression analysis was used to regress the attitudinal factor scores against the dependent variables of ethnicity, gender and age. Due to the fact that the nominally coded ethnicity and gender variables were effectively nominal measurements, and dichotomous in nature, logistic regression was used because these dependent variables are bi-modal in distribution. Multiple regression was used when age was the dependent variable, due to it being a ratio scaled continuous random measure. The bivariate results in Table 2 show that it is possible to reject hypotheses one to four on a number of attitudinal measures of learning and assessment differences across ethnicity and gender, however there were no significant differences identifiable across age. Furthermore, Table 2 shows 22 separate attitudinal relationships from the 27 attitudinal measures incorporated in the study. Interestingly, there was a noticeable interaction between ethnicity and gender on 2 of the 27 individual attitudinal measures. These were female European students being less likely to agree with lecturers organizing groups for presentations, female European students also disagreeing with the notion of acquiring similar ideals and values and male Asian students agreeing that acquiring similar ideals and values is positive. Table 2 below also shows similarities between gender responses on variables that potentially could be measuring a single construct. For instance, Do the minimum amount to pass, Only put effort into some parts of the syllabus, Study only particular areas for test or exams are all variables, which not only measure a similar attitudinal characteristic, but also exhibit identical ethnic relationships. As a consequence, factor analysis was considered an ideal multivariate technique to explore these attitudinal interrelationships. By analysing the relationship between the latent attitudinal constructs, or factors, and the demographic characteristics of ethnicity, gender and age we are able to reject hypotheses one to four, and enabled further testing of hypothesis five and six. Logistic regression was the most appropriate technique to use to test the relationship between the dichotomous, bi-modally distributed dependent variables of ethnicity and gender, and the factors, and multiple regression was used to regress age against the respondent factor scores. Table 3 shows the details of the regression results. Older students are less concerned about lecturer impartiality. From the empirical results presented in this brief exploratory study, it is apparent that it is possible to reject hypotheses one to six, and to conclude that there are distinctive significant differences in student attitudes towards learning and assessment across ethnicity, gender and age. From the logistic and multiple regression analysis it is evident that European students have a more heterogeneous approach to living, thinking and learning. They are less-conformist in the study, not so concerned about the impartiality of lecturers and have a preference for group assignment work. Conversely, Asian students are less likely to approach living, learning, and thinking in a heterogeneous manner. In the study, they are more conformist, concerned about lecturer impartiality, and prefer to work on assignments individually. Females are less likely than males to approach living, thinking and learning in a heterogeneous manner, less concerned than males about lecturer impartiality, and are more likely to be concerned over preparation for learning and assessment. In terms of age, it is evident as the age of students’ increases they are keen to learn, and want to do more than the minimum requirements. Furthermore, they prefer to work on their own, and are concerned about lecturer impartiality. Given the significance of increasing ethnic diversity, a redress in the gender balance and an increase in mature students returning to tertiary study in New Zealand, the implications of these findings appear significant for university management as well as academic programmes and assessment development. For example the use of non-traditional approaches may be appropriate, such as a greater range of types and levels of courses on offer. Many universities already include a student support service that includes elements such as an induction programme, a study skills programme, special needs support, childcare and careers advice. With the increase in access comes an increase in responsibility for managing the issues of wider access. To manage effective strategies, such as a systematic audit of access-related activities, primary responsibility for accountability needs to be placed upon the institution and its academic staff. The attitudinal results may have been more significant across age, had the sample exhibited a greater age variation (the mean age was 23 with a standard deviation 5, which indicated an age distribution concentrated between 19 and 24). Another limitation in this study is the lack of a detailed analysis of the four-way interaction between ethnicity, gender, age and attitude. Although a rudimentary investigation was undertaken between these four characteristics, it is believed that by using an interdependent technique such as cluster analysis, further insights may be gained. In sum, the statistical results from this study provide empirical evidence to support what some academics have suspected in HEIs in New Zealand, in that it confirms that ethnicity, gender and age are indeed key factors to consider when evaluating students’ beliefs and values towards learning and assessment. With societies becoming increasingly diverse in terms of ethnicity, gender equality, and later retirement, there comes a responsibility to understand and accommodate the differences. When these changes are observed in the tertiary population it becomes essential that the university system, in its entirety, is sensitive to the needs of their diverse environment. One of the most critical issues for the future may well be the quality of teaching and learning (Ball, 1991). Further research into the quality of the educational experience provided may prove insightful when planning ahead. The effectiveness of implemented strategies, such as student-feedback analysis, for example may require further questioning. With respect to the model of Educational Culture, there are a number of areas for potential development. The focus could be placed on the core element of the model (the purpose of higher educational institutions) and its alignment with the management of those institutions. The management of higher education institutions and access are also closely integrated elements that may warrant further research. Altbach, P. (2004). Higher education crosses borders. Change, 36(2), 7. Ball, C. (1991). Quality and qualities: An overview In T. Schuller (Ed. ), The future of higher education (pp. 100-105). Buckingham, UK: Society for Research into Higher Education. Black, H., & Duhon, D. (2003). Evaluating and improving student achievement in business programs: the effective use of standardized assessment tests. Journal of Education for Business, 79(2), 9. Bloom, B. (1956). Taxonomy of educational objectives: the classification of educational goals. London: Longman. Brown, R. (2002). Overcoming educational exclusion The American Behavioral Scientist, 45(7), 27. Clark, B. (1998). Creating entrepreneurial universities: Organizational pathways of transformation: Pergamon. Cranton, P. (2006). Rethinking evaluation of student learning. Higher Education Perspectives, 2(1), 8. Dewey, J. (1972). Experience and education. New York, USA: Collier Books. (Original work published 1938). Faris, R. (1998). From elitism to inclusive education: Development of outcomes-based learning and post-secondary credit accumulation and transfer systems in England and Wales. Victoria, BC: Centre for Curriculum, Transfer and Technology. Faris, R. (1999). From Elitism to Inclusive Education: Development of outcomes-based learning and post-secondary credit accumulation and transfer systems in England and Wales. Victoria, BC: Centre for Curriculum, Transfer and Technology. Gervedink, G., & Collis, B. (2005). How can academics stay in control? British Journal of Educational Technology, 36(6), 1035. Greenbank, P. (2003). Collaboration in the assessment process: an initial evaluation of collaboration on an undergraduate business and management course. Teaching in Higher Education, 8(3), 15. James, R. (2003). Academic standards and the assessment of student learning: some current issues in Australian higher education. Tertiary Education and Management, 9(3), 12. Jarvis, P. (2001). Lifelong learning: Universities and adult education. Asia Pacific Education Review, 2(2), 7. Jeffrey, D., & Manganiello, D. (Eds.). (1998). Rethinking the future of the university. Ottawa, Canada: University of Ottawa Press. Johnson, S., & Rush, S. (Eds.). (1995). Reinventing the university: Managing and financing institutions of higher education. New York, USA: John Wiley & Sons, Inc.
Kristensen, S. (2001). Learning by leaving - Towards a pedagogy for transnational mobility in the context of VET. European Journal of Education, 36(4), 10. Lauer, C. (2002). Enrolments in higher education: Do economic incentives matter? Education and Training, 44(4/5), 7. Lincoln University. (2006). Academic Audit Portfolio 2006. Canterbury, NZ: Lincoln University. MacKnight, C. (2000). Teaching critical thinking through online discussions. Educause Quarterly, 4, 4. Marginson, S. (2000). Rethinking academic work in the global era. Journal of Higher Education Policy and Management, 34(2), 13. Marginson, S., & Considine, M. (2000). The enterprise university. Cambridge, UK: Cambridge University Press. Martinsons, M., Martinsons, A., & Aelita, B. (1996). Conquering cultural constraints to cultivate Chinese management creativity and innovation The Journal of Management Development, 15(9), 18. McLoughlin, C. (2001). Inclusivity and alignment: Principles of pedagogy, task and assessment design for effective cross-cultural online learning. Distance Education, 22(1), 23. Myburgh, C., Niehaus, L., & Poggenpoel, M. (2002). International learners' experiences and coping mechanisms within a culturally diverse context. Education, 123(1), 23. Oblinger, D., & Hawkins, B. (2005). The myth about students. Educause Review, 40(5), 12. Owen, W., & Sweeney, R. (2002, 1-3 November). Ambiguity tolerance, performance, learning, and satisfaction: A research direction. Paper presented at the ISECON Conference, San Antonio, TX. Partington, P., & Brown, G. (1997). Quality assessment, staff development and cultural change. Quality Assurance in Education, 5(4), 10. Peters, M. (Ed.). (1997). Cultural politics and the University in Aotearoa/New Zealand. Palmerston North, NZ: The Dunmore Press Ltd.
Prime, G. (2001). A missing element in the retention discussion. Black Issues in Higher Education, 18(21), 2. Rambruth, P. (2000). Cross cultural learning behaviour in higher education: Perceptions versus practice. Unpublished paper presented at the Faculty of Commerce and Economics. Robson, I. (2005). Implementing a performance measurement system capable of creating a culture of high performance International Journal of Productivity and Performance Management, 54(1/2 ), 9. Rogers, C. (1969). Freedom to learn. Columbus, Ohio: Charles E. Merrill Publishing Company. Rowley, J. (2000). Is higher education ready for knowledge management? The International Journal of Educational Management 14(7), 10. Sander, P., Stevenson, K., King, M., & Coates, D. (2000). University students' expectations of teaching. Studies in Higher Education, 25(3), 15. Singleton-Jackson, J., & Newsom, R. (2006). Adapt, adjust, respond: Perspectives on current trends in American colleges and universities. Higher Education Perspectives, 2(1), 14. Sittenfield, C. (2002). Think for a change. Fast Company(56), 3. Smith, A., & Webster, F. (Eds.). (1998). The postmodern university? Contested visions of higher education in society. Buckingham, UK SRHE. Spencer, J., & Jordan, R. (2001). Educational outcomes and leadership to meet the needs of modern health care. Quality in Health Care, 10, 8. Stapleton, P. (2001). Assessing critical thinking in the writing of Japanese university students. Written Communication, 18(4), 506-548. Starr, P. (1999). Scored for life The New Republic, 221(22), 4. Sugar, W., & Bonk, C. (1998). Student role-play in the world forum: Analyses of an Arctic adventure learning apprenticeship. Electronic Collaborators, 6(1-2), 29. Sursock, A. (2002, 12-13 March). Reflection from the higher education institutions' point of view: Accreditation and quality culture. Unpublishd paper presented at the Working on the European Dimension of Quality: International Conference on accreditation and quality assurance, Amsterdam, The Netherlands. Taylor, J. (2002). Using assessment to build a culture of improvement. The Presidency, 5(2), 2. Thomas, M. (2003). Shifting Epistemology: Tracing the history behind the nature of knowledge in American higher education, forming the foundations of student intellectual development theory American Educational History Journal, 30, 8. Tippeconnic, J., & Faircloth, S. (2002). Using culturally and linguistically appropriate assessments to ensure that American Indian and Alaska Native students receive the special education programs and services they need. Retrieved July 24, 2006 from <http://www/edvantia.org/publications/pdf/EDORC02-8.pdf>. Trompenaars, F. (1993). Riding the waves of culture. London, UK: Nicholas Brealy. Young, J. (2004). Becoming different: Accessing university from a low socioeconomic community - Barriers and motivators. Systemic Practice and Action Research 17(5), 1. Charles Lamb is Senior Lecturer, Head of Marketing, Commerce Division at Lincoln University.